and NITZ ARANCON, Correspondent . THE dramatic rise in the prices of branded cigarettes because of the “sin tax” created a demand for much cheaper ones. This paper went around the city and found cartons of cheap cigarettes being sold openly and in broad daylight in a number of stores. In one sari-sari store in Barangay Consolacion, a pack of Winston cigarettes commands a price of P80 per pack. Some three kilometers away is another store selling a pack of “Winston” cigarettes for as low as P20 per pack or P200 for every ream containing 10 packs. NBI regional director Patricio Bernales said the additional taxes being imposed on legitimate cigarette manufacturers have resulted in the production and distribution of cigarettes made to appear as branded. Bernales said this following the raid of a warehouse in Kauswagan that resulted in the arrest of a Chinese identified as Shi Zhulian of Fujian, China. 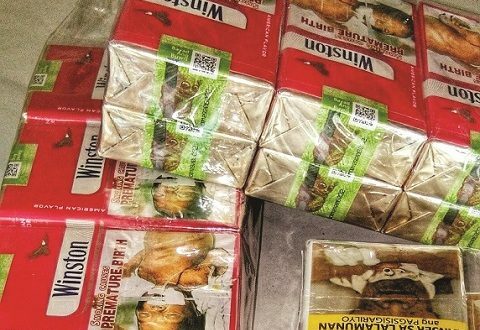 The NBI and Bureau of Internal Revenue (BIR) seized some 1,240 large cartons of inferior cigarettes inside the warehouse near Kong Hua High School in Kauswagan. NBI agent Nolan Gadia, the leader of the team that carried out the raid, quoted BIR officials as saying that the government could have collected P21 million in taxes based on the quantity of the seized cigarettes. The confiscated cigarettes were taken by the BIR even as authorities padlocked the warehouse whose owner has yet to be identified by investigators. Bernales said the establishment had no mayor’s permit to operate. He said investigators were still checking if the barangay hall has registered it. Bernales said the NBI could not yet say if Shi’s group has anything to do with the production of “fake” cigarettes in Alwana in Cugman and Villanueva town in Misamis Oriental that were uncovered by the BIR and Criminal Investigation and Detection Group (CIDG) last year. Neither could Bernales say if the seized cigarettes were manufactured in the city or elsewhere. “Kadtong sa Alwana ug Villanueva, naay may mga cigarette maker nga nakuha adto pero kini wala man. Mao na nga atong gisusi karon kon kini nga mga sigarilyo dinhi ba gi-manufacture,” Bernales said. Shi was released by the NBI at around 11:30 am on Thursday. His Filipino “associates” whom Bernales has yet to name were also released. Pressed to identify Shi’s associates, Bernales asked that this paper wait for the NBI to complete its investigation. Shi’s whereabouts remains unclear but a document shown by Bernales to reporters shows the Chinese’s address in Cagayan de Oro: Sun Merchandise, Capt. Vicente Roa Street. Bernales said the NBI had to release the suspects because investigators were still building a case against them. He said the NBI would likely charge them with infriengement of intellectual property rights. “Dili man nato sila ma-inquest kay kulang pa man ang atong mga documents. Ma-o nang amo silang gielease. Apan amo silang pasaka-an sa kaso,” Bernales said. The NBI said representatives of Philip Morris Philippines Manufacturing Inc. and Japan Tobacco Inc. have confirmed that the confiscated cigarettes were inferior copies of their products.